Increase litter picking productivity with the ergonomic Handyhoop - the perfect partner for the mechanical litter picker. The Green Sack Heavy Duty Black Bag 18x29x38 inches. The Green Sack GR0008 Medium Duty Black Bag 18x29x38 inches. 100% recycled Polythene. Holds 15kg. 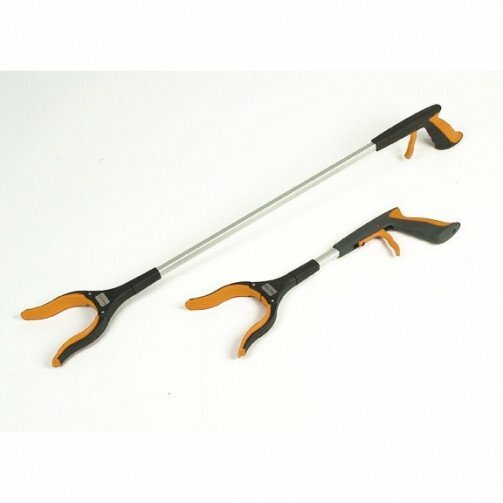 Easy Grip Mechanical litter picker ideal for safely collecting hazardous waste. Ergonomic handle- grabber claws can be adjusted through 180 degrees and 32 inch in length for maximum versatility. Soft end tips on claws for safe litter picking of hazardous waste such as glass,needles, sharps ect. Also ideal for removing debris or used screens from urinals or toilets. Pack of 5.